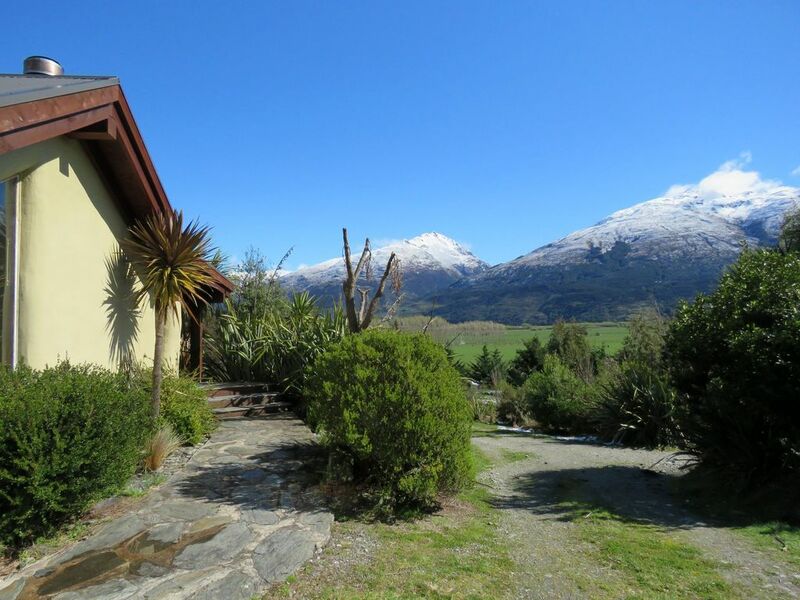 Gorgeous character cabin on 5 beautiful acres located via breathtaking 35 min drive from Wanaka (1.25 hour drive to Haast). Wifi onsite. The cabin's kitchen, dining and lounge is totally 'open plan'. There is one cosy bedroom with queen bed and a fold-out futon in the lounge, so suitable for 4 adults or 2 adults 2 children, etc. The toilet/shower unit is attached via a enclosed corridor from the kitchen. Stunning views of Lake Wanaka and Southern Alps, native birds, peace and privacy, large flat grass area for play, and a stream on the property for your enjoyment. Anglers can wander along Makarora River, or drive less than 1km to the boat ramp. Trampers can explore neighbouring Mt Aspiring National Park or the many short walks and day hikes through the Haast Pass, such as the Blue Pools (20 min drive). Makarora has no supermarket (so plan accordingly), but does have a fantastic local pub/restaurant offering meals all day in the summer months. NO SMOKING allowed inside the cabin. There is no cell phone reception in Makarora. Bathroom is its own little hut accessed from outside the back door. Not a lot of dry firewood. Nearby Boundary Creek is good for collecting driftwood. Lovely place, felt secluded from the world which was nice. Full privacy from strangers; you can keep all the curtains and doors open and not have a worry over anyone seeing you! Spacious home. One bedroom and the other bed is in the living room but still had big living room & dining area. Plenty of DVDs and board games to keep you occupied. Having a fireplace is one of my fav things! Absolutely beautiful drive to the place if driving by lake wanaka&hawea. While its in the middle of nowhere and you have a massive outdoor area for yourselves, highway is so close that you always hear cars driving by. Didnt feel like I was in the nature as I wished to be. Full glass window in the shower/toilet visible from the garden area. Wouldnt be so bad if i was with my partner but family/friends trip? little awkward if someone decided to go out to the garden while i was showering/pooping! No coffee. Take your coffee with you just in case! We got so used to places always being fully stocked on coffee we didn't take any.. We suffered very much as we are all caffeine addicts! We did many trips to the cafes nearby. Their duvets and bath mats couldve used a wash.. It has a funny smell. But overall, I enjoyed my stay and wouldn't mind going back!